Some say it’s the journey that matters most, while others will argue it’s the destination that’s the most important. Who is right and who is wrong? In this game, the destination for both players is the goal, but the journey is anything but straight forward. There is no path to follow other than the one you create. In the end, it will be the experience you remember most and benefit from. 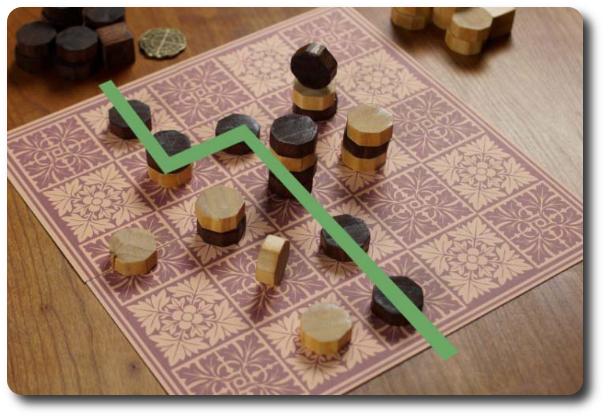 Tak, designed by James Ernest and to be published by Cheapass Games, will reportedly be comprised of 44 or 62 wooden game pieces, depending on the size of the accompanying game grid board. As this is a review of a prepublished game, I cannot comment on the component quality. The pieces will reportedly be made of white birch with walnut stain on half of the pieces. The number of pieces do not reduce the game play, but do reduce the game play area. The 44 piece set allows for a 5×5 grid board and the 62 allows for a 6×6 grid board. Grid board spaces can be as small as 3×3 or as large as 8×8. Technically even larger, but that would be silly. Regardless of the number of pieces and the size of the grid board, the game play does not change for the two players. Each player has an equal number of pieces at the start of the game. Depending on how many pieces are being used, the player will have 1 or 2 different types of pieces available. “Normal” might be a misleading name for the most common game piece, as they are anything but. They can be played two different ways. The first and most common is playing them as a “Flat Stone”. This is when the Normal piece is placed on its largest and flattest side on a grid board square. “Flat Stone” Normal pieces can be stacked during the game and moved as a group. The second is playing a Normal pieces as a “Standing Stone”. “Standing Stone” Normal pieces are turned on their narrowest and widest side to stand on end on a grid board square or stack of “Flat Stone” Normal pieces. Nothing can be placed on top of a “Standing Stone”, making is something of a wall, blocking stack movement. Capstone pieces are played in the same way as a “Standing Stone” Normal piece and block movement, as well. However, Capstone pieces can also change “Standing Stone” Normal pieces to “Flat Stone” Normal pieces if the Capstone piece is moved on top of it without being part of a stack. 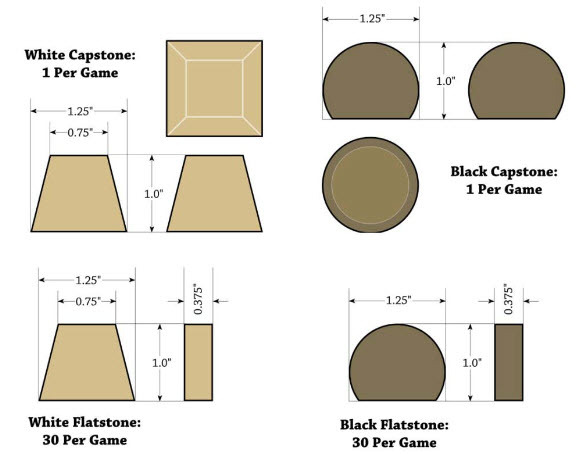 Capstones are a very versatile piece, having characteristics of both the “Flat Stone” and the “Standing Stone”, but the Capstone piece does not count as points if the game needs to be scored. Tak is played in rounds and turns with no set number of rounds per game. To set up the game, place the grid board between the two players and separate the Normal and Capstone pieces by color. Both players will have the same number and type of pieces. It’s highly recommended that new players and younger players use a small grid board when first learning. For the first round of the game, the players will take a Normal piece belonging to their opponent and place it anywhere on the grid board as a “Flat Stone”. The piece must be placed in an empty square. 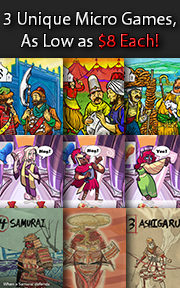 For the second and subsequent rounds, each player takes a single turn using their own pieces. On the player’s turn, they have 2 possible actions. The pieces not yet placed to the grid board are in the player’s reserve. Any piece in the player’s reserve can be placed to the grid board. “Flat Stones”, “Standing Stones”, and Capstone pieces can be placed in any empty square. Movement is a bit more involved. Any single piece or a stack of pieces with the top-most piece belonging to the player can be moved. This includes a single “Flat Stone”, single “Standing Stone”, the Capstone, and a stack of “Flat Stone” Normal pieces with the top-most piece belonging to the player. When a piece moves, it’s always in a straight line (never diagonal). Moving into an empty square with a single piece ends the movement. Every other type of movement has a few rules. If moving a stack, the player must leave the bottom-most piece on each square they move on and through. This will reduce the size of the stack as it moves across the game board, depositing the other pieces in the stack on the grid board like a trail of breadcrumbs. Stacks have no height limitations, but there is a carry limit that defines the total number of pieces that can be moved from a stack. The carry limit is directly proportional the size of the grid board. If playing on a 4×4 grid board, the carry limit would be “4”. Stacks cannot move onto or through a square occupied by a Capstone or a “Standing Stone” Normal piece. “Standing Stone” Normal pieces can be on stop of a stack, as can the Capstone. If the Capstone ends its movement on a “Standing Stone” Normal piece belonging to any player, it changes the “Standing Stone” Normal piece to a “Flat Stone” Normal piece. After the player has taken one of the two actions, it’s the next player’s turn. When both players have taken their turn, the round ends and a new round then begins. The game can end several different ways. The first player to create a “road” or “path” that connects one side of the grid board with the opposite side using their Capstone and “Flat Stone” Normal pieces wins the game. This is the primary goal of all the players right from the start. It’s possible that a player might create their road and their opponent’s road on their turn. If this does occur, victory goes to the player who created the roads. The game can also be won if a player places their last piece to the grid board or there are no more free squares, forcing the game to end. Then both players look down upon the grid board to determine which player controls the most squares. Squares occupied by Capstones and “Standing Stones” are not counted! Optionally, the players can add 1 point for every piece not played to the board, as well. There are a number of game variants available for those who like to spice things up. Those provided in the rules are summarized here. Until the player or players understand the game and its hidden depth, it’s recommended that a 4×4 grid board be used and each player is given 15 Normal pieces. The Capstone will be used later when the players are attempting to outwit and outmaneuver their opponent on a bigger grid board. A grid board gives the game an organized playing area, but it’s not necessary. All that is needed to play Tak are the pieces and a small object to designate the center of the grid board. 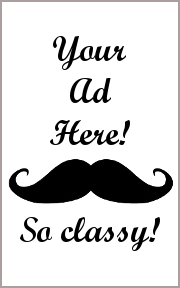 If needed, a simple sketched grid could be done on the back of a place mat or in the sand with a stick. Tak at royal courts was traditionally played (no not really) on a 6×6 grid board. Game play was the same, except for one small rule of etiquette that everyone was expected to follow. When the player is 1 turn away from finishing their road, they must call “Tak”, which gives their opponent a clue that they are about to lose. Not for the weak of heart, a master level game of Tak is played on an 8×8 grid board (or larger) and each player is given 50 Normal pieces and 2 Capstones. What makes the game difficult is the size of the grid on which it’s played. With a great deal of space, players must push forward to connect opposite sides, but must also take steps to hinder their opponent from doing the same. It’s like playing Chess on a really large game board, where the pieces are in direct competition, but not close enough to do much about it. There is no single design for the Tak pieces. Players can make their own, giving their game a unique and personal touch. The only restrictions are size, meaning the pieces must be able to fit in a single square space without crossing over the grid board boundaries. The pieces must also be able to stack and the Normal pieces must be able to be played standing up or lying down. The pieces can be made of wood, stone, plastic, or any other material. Most craft stores will have everything a player needs. If the players are willing to make their own Tak pieces, they might also consider making a hybrid grid board. The best example is a 5×5 grid board with the outside squares all in one color and the inside squares another color. Visually, this creates 2 different grid boards that coexist. Specifically, the 5×5 grid board and the middle 3×3 grid board. This allows the players to have a single grid board that can be played 2 different ways. To learn more about Tak, visit the publisher’s website or visit the Kickstarter campaign. The Child Geeks who had played abstract games like Chess and Checkers were able to jump right into the game. Those who were not as familiar only took a few more minutes of coaching to understand how everything worked. Both groups quickly dug in and started to work their way to the other side of the grid board, stacking, blocking, and stomping a path. According to one Child Geek, “The hardest part of the game is trying to figure out where the other player is going to move pieces. It can really mess things up if they are moved someplace you don’t think of.” The grid board continually changes as pieces shift position. While I thought many of the Child Geeks would find it frustrating, few were troubled by it. As one Child Geek put it, “Nah. As the game changes, you just have to think differently. It’s not a big deal. It makes the game easier, actually.” When I asked how, the Child Geeks explained that a changing grid board always opened new paths to explore. Pretty cool. When the games were over, the Child Geeks voted to approve Tak. The Parent Geeks also enjoyed the game, finding it to be an excellent exercise in tactical and critical thinking. According to one Parent Geek, “You need to be tactical, but I’m not too sure how strategic you need to be. Every player has the same goal, but how you go about it is constantly changing. 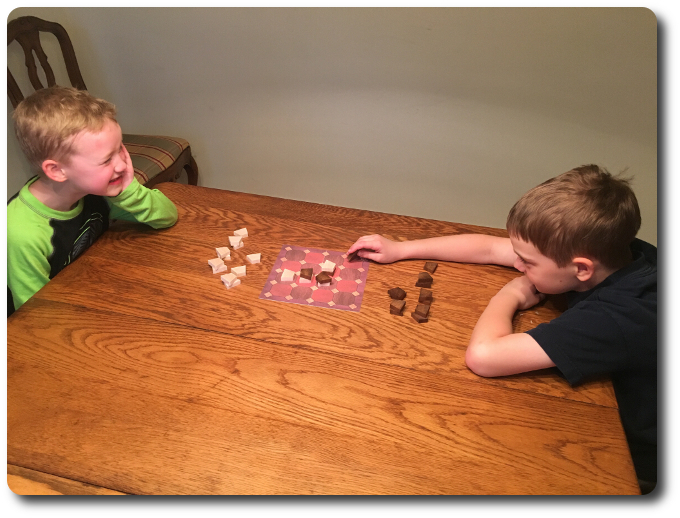 A great game for old and young minds alike.” The Parent Geeks enjoyed Tak with their children and with their peers, finding the game balanced regardless of who their opponent was. As one Parent Geek put it, “I always like games that feel evenly weighted for players who have different skill levels. Really, it’s all about a player’s ability to think things through and you learn a great deal after every game.” Which is something I heard often from the Parent Geeks. They were very happy with how much they learned after every game and were able to use to improve their next. Even a defeat was a positive experience. All the Parent Geeks voted to approve Tak. The Gamer Geeks appreciated the game’s tactical and subtle strategic value. They also found it to be deep enough to be worth playing, but it didn’t keep their attention for long. As one Gamer Geek put it, “I think the game is fine based on its design, but the fun value just isn’t there. Unless of course you really like games like this.” Another Gamer Geek said, “Games first and foremost have to be engaging and interesting. This game is both of those things. After that, you have to be intrigued by the game. It has to hook you. This game does not. The games greatest asset, simplistic complexity, has no snap to it.” What it came down to for the Gamer Geeks was the appeal of an abstract game. Half of the Gamer Geeks loved Tak while the other half found it forgettable. 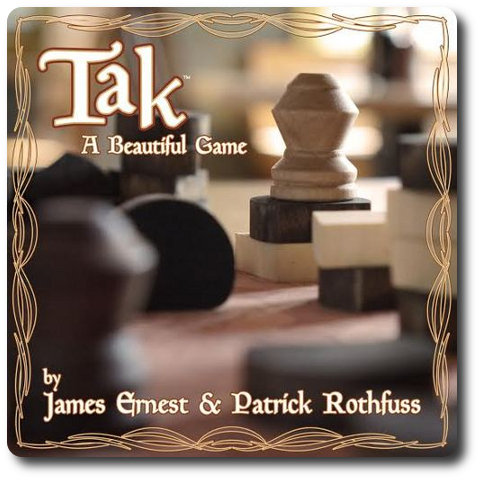 Tak is a fictional game created by author Pat Rothfuss in his Kingkiller Chronicle books. Tak is not a game about war or even about winning. It’s described as a game you are meant to enjoy and get lost in its beauty, which I understand to mean the game’s nuance. It’s also a game influenced by Go, and I found the game to not be about “beauty”, but about navigating my way through someone elses’ agenda. So, I guess it’s more like my life at the office, than anything else. Be that as it may, the game has a great deal of depth and the more pieces you have, the more depth you find. It’s a brilliant mix of obvious choices and complex tactical moves. Your strategy will always be the same, but your tactical approach will shift each round. The game is easy enough for a Child Geek to quickly learn and complex enough to keep a Gamer Geek engaged. Tak evolves as the players take their turns. A single move can have enough impact to be felt for several rounds. And yet, a player is not fully aware of how their move influences the game until later. Again, the game evolves, opens, and changes organically, responding to each new piece is surprising ways. I have always enjoyed Abstract Strategy games and Tak is no exception. What I enjoy most is the way the pieces can be changed even after being played. I can move my opponents pieces just as easily as I can move mine, but the real trick is putting myself in a position where such an action is beneficial. Your opponent is attempting to do the very same thing, which means both players have to dodge, duck, twirl, and bob like two boxers in the ring. When the right opportunity arrives, you have to be ready to take a swing. If you enjoy games where strategy and tactics are useful, but not nearly as important as having the ability to be mentally flexible, where victory is the destination with no set road, and there is always an opportunity to learn from you mistakes, then do play Tak. If you find the game too easy, play on a bigger grid board. If it’s too confusing, play on a small grid board. Tak is a game that wants to be played and for you to be challenged, not frustrated. Still, expect to be frustrated. Opponents seldom do what you want them to. Tagged Abstract Strategy Games, Child Geek Approved, Parent Geek Approved, Prepublished Games. Bookmark the permalink.